Spice up your LBD in this gorgeous black midi by Grace and Hart! Crafted with floral lace embroidery, it features a cold shoulder design and partial lining for a subtle peek of skin. Cinched at the waist, it falls into a fluted skirt allowing for ease of movement. Make this yours to rent now for an upcoming day at the races or cocktail evening. 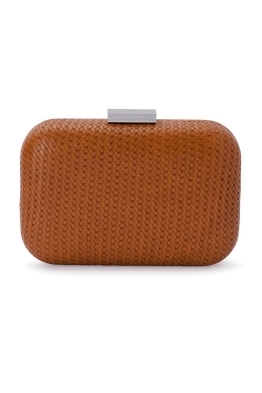 Style this number with a black heel, wavy hair and gold drop earrings. Go for the bronzed goddess look with a flushed cheek and pink lip. 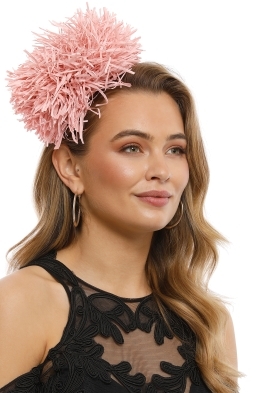 Finish the look with a red fascinator available to hire! 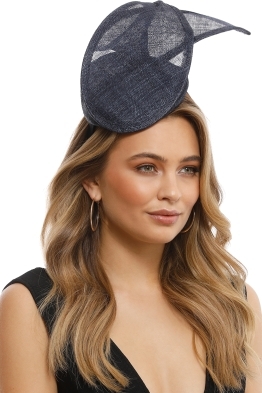 Read our blog post on how to wear a fascinator for race day for more styling tips. Cavalier Cold Shoulder Dress is rated 4.8 out of 5 by 26. Rated 5 out of 5 by Laurel from A Race Day I rented this dress for a day at the races and iit looked lovely! Fitted well and I received so many compliments as to how lovely the dress looked! Another dress hire and another wonderful customer experience from the great team at Glamcorner! Thank you! I will be back !! Rated 5 out of 5 by Tara from LOVE this dress! Loved this dress! It was a great fit and comfy for the entire evening. Material is thicker, which is flattering but I also agree with other reviews that you wouldn't want to wear it on a very hot day! Rated 5 out of 5 by Natasha from Cocktail dress for 21st Birthday I rented this dress for Saturday night for a 21st. My dress was very comfortable, warm, colourful and fit perfectly, hid bumps in all the right places. I got many compliments on the night about this dress. Rated 5 out of 5 by ls31 from Beautiful dress with stunning detail I rented this for an opening night theatre event and was very comfortable to wear. The detail of the embroidered flowers was stunning. The dress had a built in bra and was fully lined. The detail around the neckline and hem finished the dress of perfectly. I received many, many compliments. I dont wear florals usually but chose this to stay in the theme of the evening...this dress was more than I had hoped for...truly beautiful. Rated 5 out of 5 by Louise from Gorgeous Dress True to size, beautiful quality fabric and very comfortable. Felt so confident wearing this dress. I hired two dresses and wore both and this was my backup dress but my husband really liked it so I got to do an outfit change for the evening, loved it!! Rated 5 out of 5 by RebeccaP from True to size - don’t go up I’m a size 12, occasionally 14 depending on the brand. After reading reviews I went up a size but the 14 was swimming on me. Glamcorner were so fantastic and sent me the 12 without extra charge, and it was a perfect fit. Wore it to the races with silver leather fascinator and clutch and got so many compliments! Rated 5 out of 5 by Angela from Perfect dress for the races Such a beautiful dress - so comfortable to wear. Fabric is quiet heavy so would be great for an event in cooler months. I am usually a size 14 but decided to go up to a size 16 and also ordered the 18 as a back up. Why buy when you can hire! Rated 5 out of 5 by Sophie T from Find an excuse to wear this! 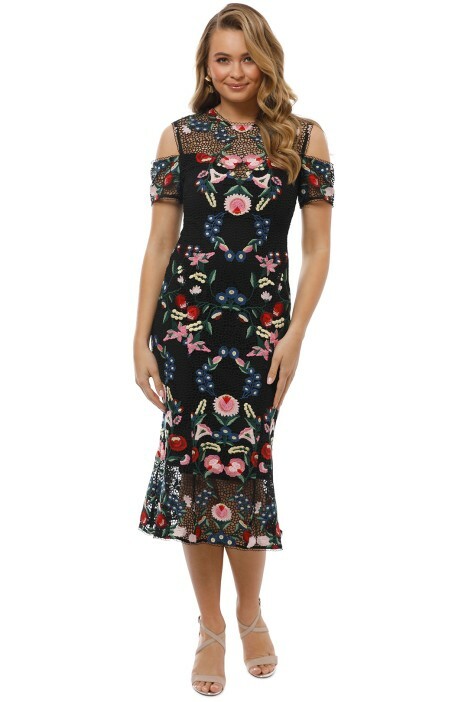 So many compliments on this dress, the floral pattern is divine! It is quite a heavy material and fully lined, so I feel may be better suited to cooler weather as it might get a bit hot on a Summers day. I am a size 10 top/12 bottom and sized up as material has no stretch, but had plenty of room especially in the bottom half!